Just yesterday I was playing around with a piece of paper, folding it, watching it, seeing how it could move. I showed it to a friend and said, "I guess what I'm doing is improvisational origami." Just today I mentioned the same thing to a different friend. She said, "Have you seen Between the Folds? 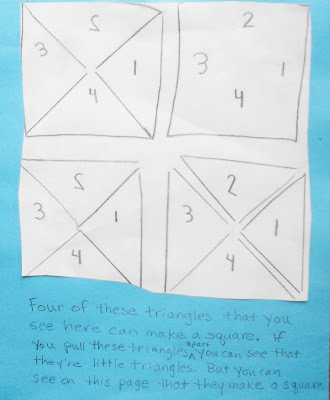 You have to..."
Every day I am finding more and more of the pieces that connect math, art, dance, rhythm, science, expression and creative practice. I think the reason I'm so excited is that I recently found my way back from a wrong turn I took with this inquiry. But, that's part of the process, too, no matter what the medium. After determining what I don't want or need to do right now, the missing pieces seem to be falling into place. If you haven't heard of Moebius Noodles, I highly recommend you check it out! We are creating an advanced and accessible math book for young kids and their parents, called “Moebius Noodles” and an online knowledge exchange hub to support it. It’s an off-the-beaten-path travel guide to the Math Universe for adventurous families. A snowflake is an invitation to explore symmetry. Cookies offer combinatorics and calculus games. Floor tiles form tessellations. The games in “Moebius Noodles” draw on these rich properties of everyday objects in ways accessible to parents and kids, even babies. 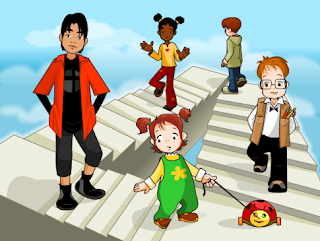 As the world turns into a mathematical playground, it transforms, one family at a time. 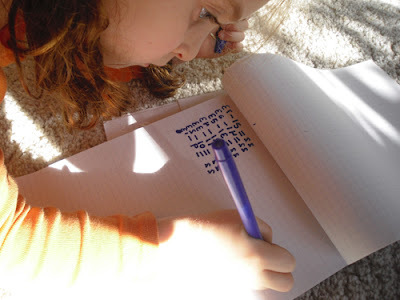 The most recent post has a fabulous menu for 'playing math every day' for the week of November 28 through December 4. 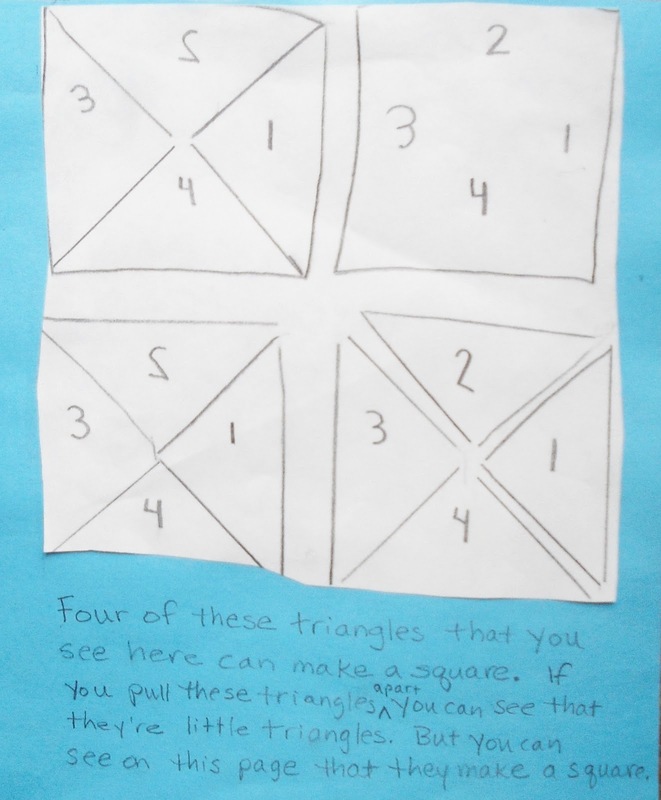 Activities include playing ball outside and then exploring a type of fractal called Apollonian gasket, fun subitizing activities, and starting a math journal. Try it out and let me know what your favorites are! Bal-a-vis-x: Rhythm is the Key Element! "Bal-a-vis-x: Rhythmic Balance/Auditory/Visual/Exercises...requires focused attention, demands cooperation, promotes self-challenge, and fosters peer teaching." Wow, a program that uses rhythm, cooperation, crossing the midline, and visual tracking all in the pursuit of an integrated nervous system that is ready learn. There are many similarities here to aspects of Math in Your Feet including rhythmic movement in concert with others, self-challenge, peer cooperation, and cross-lateral movements. Sounds like a great idea whose time has come! "Nothing exists without a center around which it revolves, whether the nucleus of an atom, the heart of our body, hearth of the home, capital of a nation, sun in the solar system, or black hole at the core of a galaxy. When our center does not hold, the entire affair collapses. An idea or conversation is considered 'pointless' not because it leads nowhere but because it has no center holding it together." I just picked up A Beginner's Guide to Constructing the Universe. I still have unanswered questions about what kinds of math are interwoven with a creative inquiry into percussive patterns. That's not to say that I am confused. I know exactly what kind of math the kids are learning, but I am sure there is more and I am searching for evidence. Some days, like this one, I find I understand math more than I think. So do you, by the way. 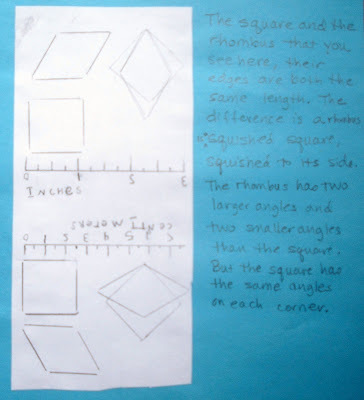 Here's is a reposting of one of my very first pieces on this blog, The Power of Not Moving (October 13, 2010), which attends to the value of a single point of stillness and focus, the center, in the moving classroom. Got this from Nic. Too cool. 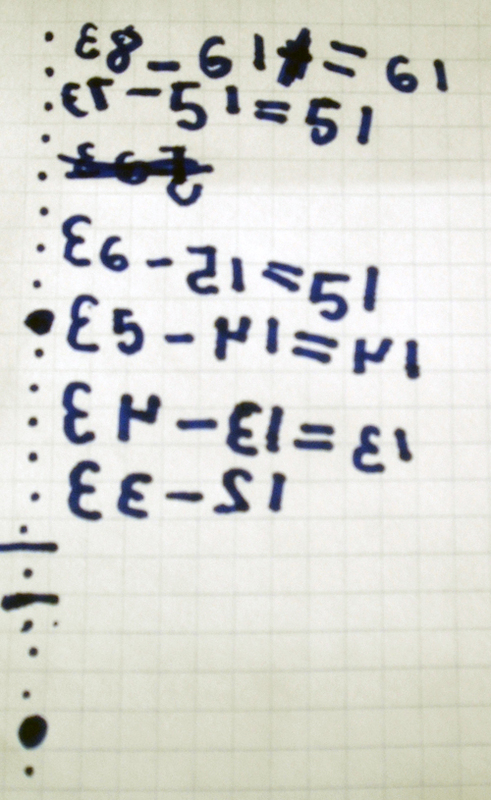 In retrospect, this amazing discovery started with parental neglect and erroneous math. I freely admit I was at fault, but it all worked out amazingly well in the end. It was all precipitated by an innocent question, yelled from another room: "Mama, what is half of 38?" 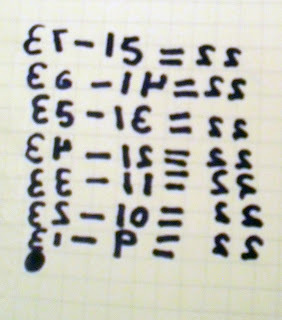 I did a little mental math: "Sixteen!" I yelled back. In my defense I was in the middle of something very important. That's why I didn't insist she figure it out herself, you see. When we were finally in the same room it took me a minute. I was actually fairly impressed with her thinking. Even though it was all wrong, she still had logic and structure to her reasoning. Can you figure out what her 'rule' was? Luckily, I had my wits about me and simply said, "Cool, look at that! 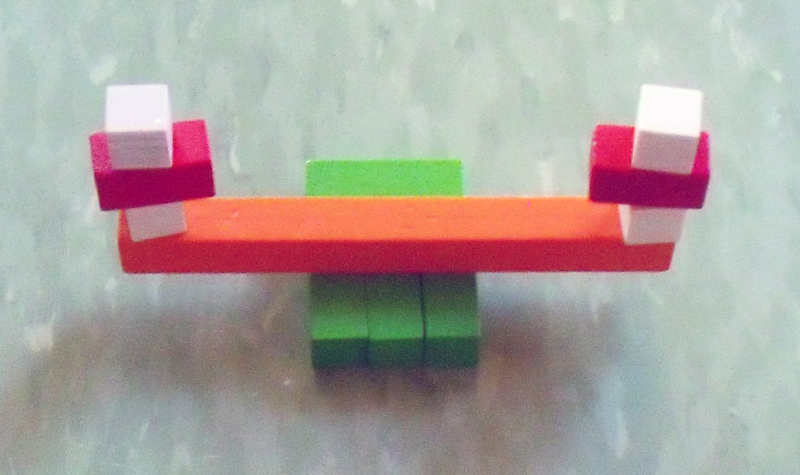 Hey, let's check your work with the Cuisenaire rods!" This was a brave move since, prior to this moment, we have done absolutely nothing with 'taking away' or 'difference' in any formal way let alone using the rods. Fortunately, the taking away part was so wonderfully obvious in this visual/tactile realm that I had no problem explaining it and the girl got it right away. During this process I also noticed that in the intervening couple months between our first major experience with Cuisenaire rods and today, her ability to visualize and attribute amounts to the rods has become second nature. Here the total number was 31, take away nine. It was so very satisfying to physically take away a number and literally see the difference. Sorry this is so blurry, but hopefully you can see that we started with 37 and took away 15. I'm not completely sure why we didn't start with the original number in question, 38, but like I said, it all worked out in the end. Just look at it! It's beautiful, don't you think? By the fourth equation I asked her if she could figure out what would come next. 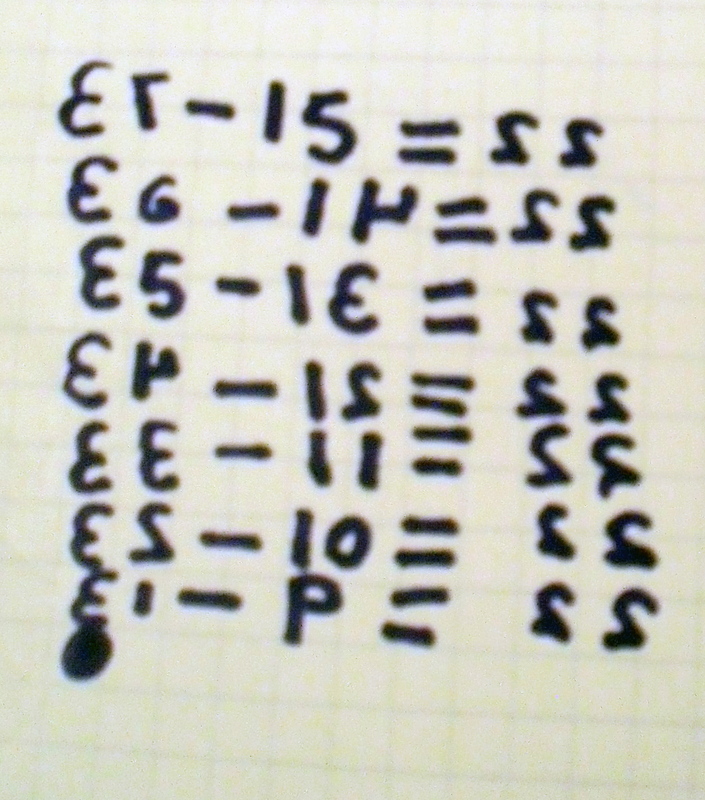 She guessed right for the last five equations, but wanted to check her work with the rods each time anyhow. Today I am basking in the joy of unexpected discoveries and a growing mind. One of my most enjoyable creative endeavors these days is accompanying my daughter (age six) on her math learning journey. 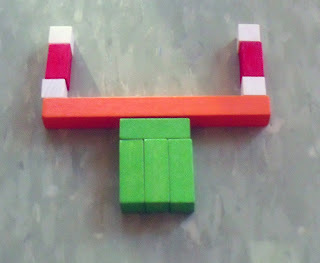 Sometimes we play games, or work with pattern blocks or Cuisenaire rods. Sometimes she wants to earn and save money so she can eventually run away with her best friend. Whatever we do, she learns best through conversation and narrative. She also learns math without me. There are plenty of times when she happens upon something 'by accident' by which I mean: things (books, puzzles, making supplies, marbles, tape...) left around the house, acted upon, forgotten for a while, ultimately to be rediscovered a month or three later and acted upon again, but this time in new ways. This happens a lot 'round here. For instance, we have tangrams in almost every room of our house. There's a magnetic puzzle book set in the car and approximately six plastic sets on the game shelf, of various colors and all mixed together. I have four sets of magnet tangrams that I got at the NCTM Annual Meeting in Indianapolis this past April. They have been on the fridge in the kitchen since then with minimal interaction...until recently, and, last I looked, they were all in use in some kind of design or another. 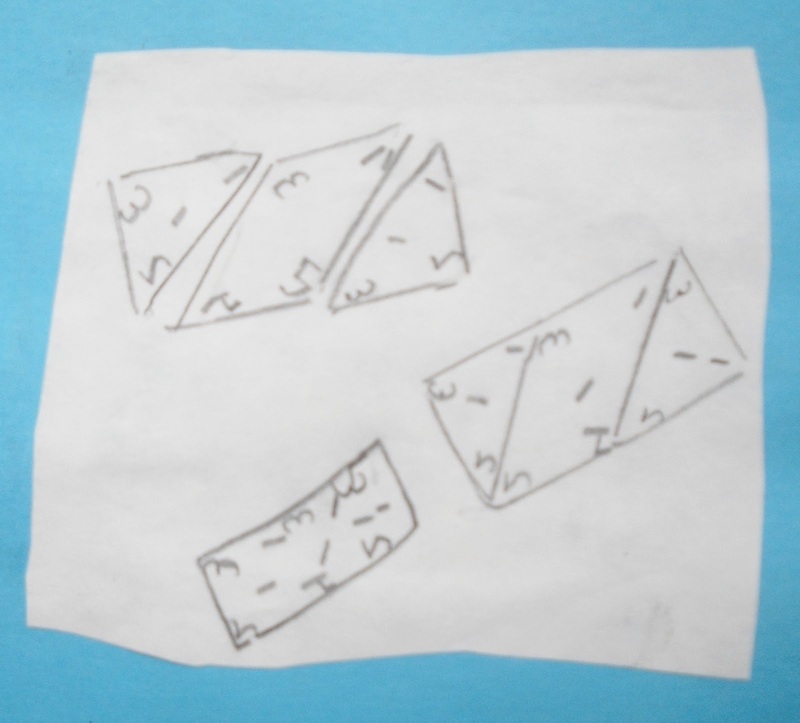 Here's what I found my dear child doing with the set of car tangrams (inside for some reason) over the last few days. 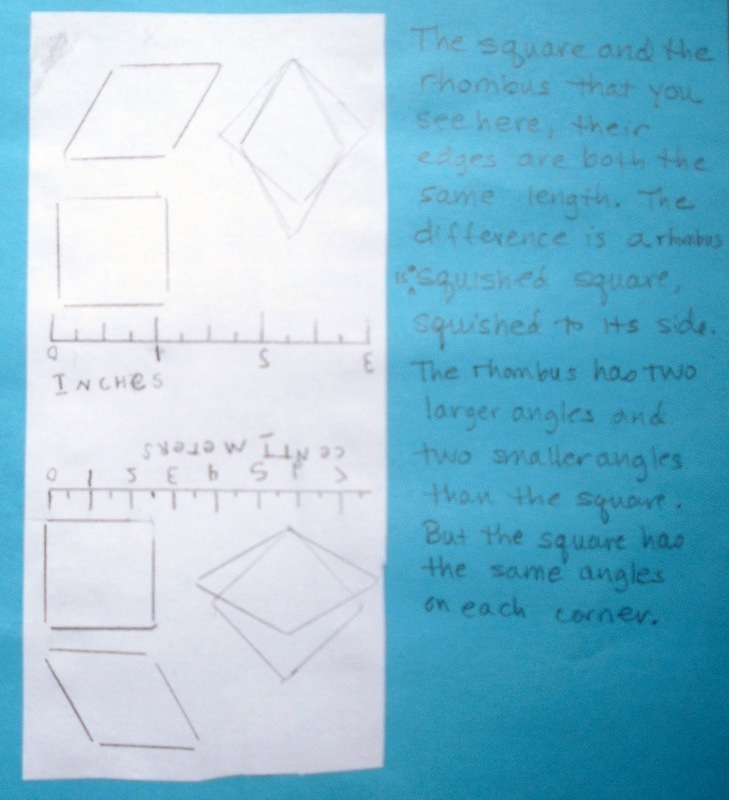 Writing about all of this made me think to look up more about the van Hiele levels for geometric reasoning. I need to spend more time with that to analyze how I'm interacting with future discoveries of hers. I also think I'd like to focus more specifically on flips, turns and slides. 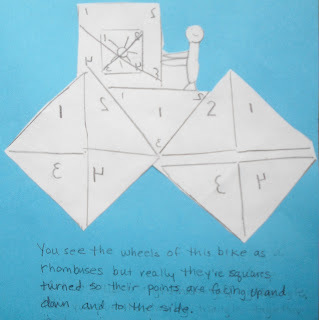 Maybe I'll be super ambitious and have us play around with flips and turns using both 2D and 3D shapes! 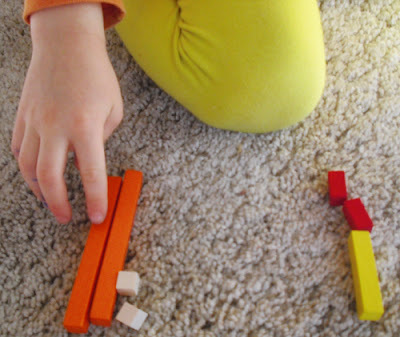 In my recent post Conversational Math: Part Two I described a game that my daughter and I like to play with Cuisenaire rods called "Build What I Have". It's really fun. So fun, in fact, that my daughter asks for it every other day or so. It was my turn to give directions. To start, take a look at how my design looked when I was finished giving directions. I should point out that there is only one layer of blocks laid out on the board we were using. I should also point out that we hid our work from each other. She is trying to replicate my design using only my spoken words as a guide. Ironically, no gestures are allowed in this game! Here's how I started: "Take three light green rods and put them together so they are all touching and all perpendicular to the bottom of the board. It should look like a square that is three units across. Now add a fourth light green rod on top of the square. It should be placed perpendicular to the other green rods and parallel to the bottom of the board. It should look like a rectangle now." Me: "Take an orange rod and place it on top of the green rectangle." Kid: "Like a teter totter." Then it was time for the big reveal...tah dah! Geez Louise, what happened?!? Her orange rod IS on top of the light green rectangle, but it appears the kid built up while I built...up? I suspect we were both right, but I am at a loss to explain why or how. I think it is accurate to call the kid's work three dimensional, but so is mine because it is built with polyhedra and not 2D lines on a flat surface.